We have been commissioned by Pastry & Baking to do a few “step by step” stories. This one is really fun celebration cake using “needlework” techniques. Enjoy! 1. 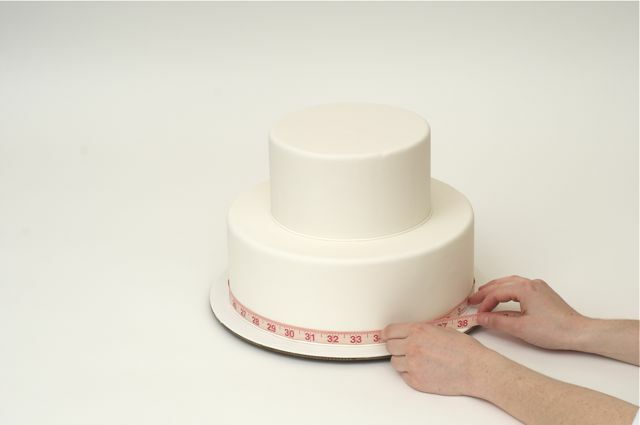 Using a measuring tape, note the circumference of each tier. 2. 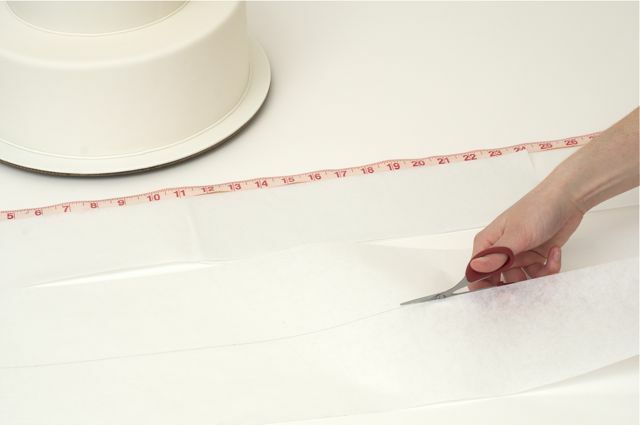 Cut a long strip of parchment paper to fit the full length and height of each tier. 3. 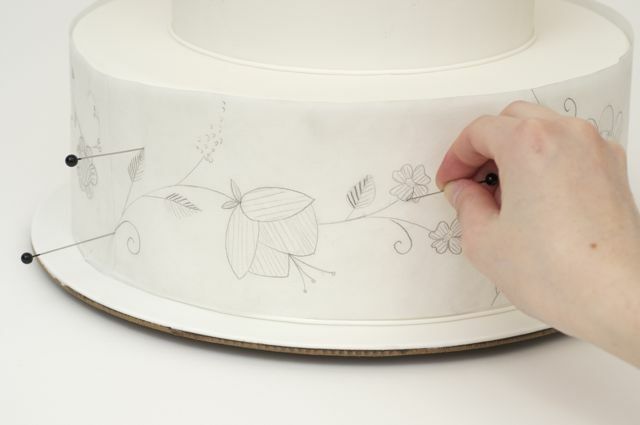 Draw design on parchment template. Here we were inspired by vintage crewelwork from Turkey. 4. 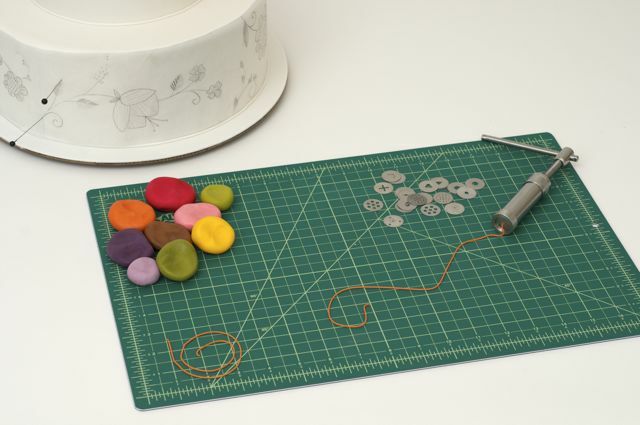 Pin parchment template to cake and score your design. Remove parchment. 5. Fill extruder/clay gun with colored sugar paste. You could use pre-colored Satin Ice Fondant or tint some Satin Ice gum paste. 6. 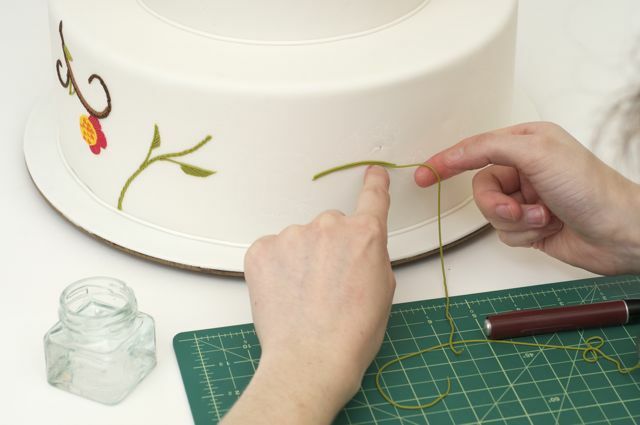 Use these 4 techniques to achieve embroidery effects on the cake surfaces - use one or a combination of all four. 7a. 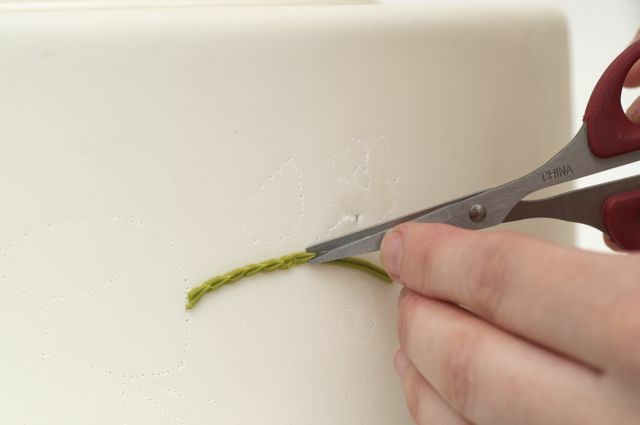 Split Stitch - adhere two noodle strips to the scored lines on the cake, using a fine brush, moisten the back with water. 7b. 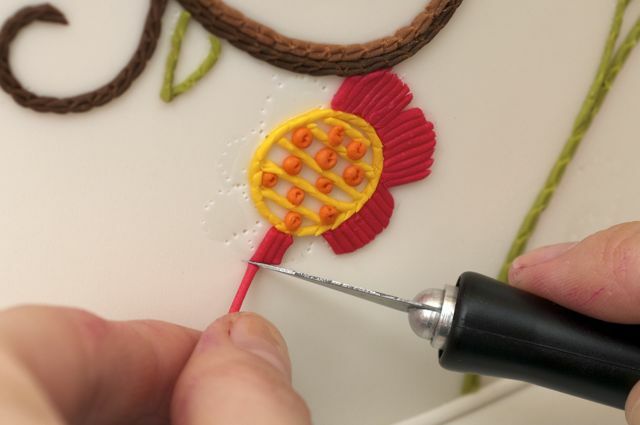 Using a pair of small sharp edged scissors, snip into the paste noodles. 8. 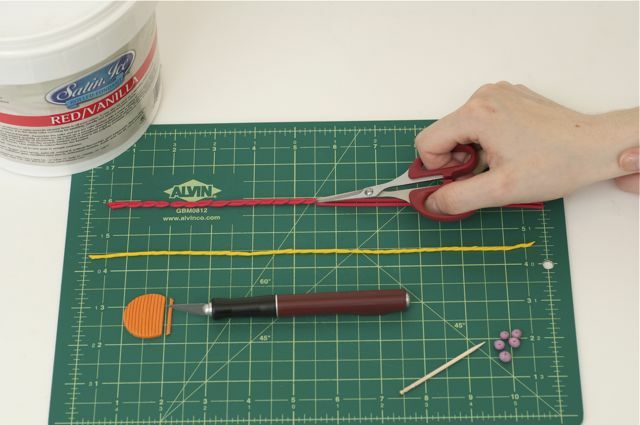 Straight Stitch: - apply one noodle strip and cut in the same fashion for a split stitch. 9. 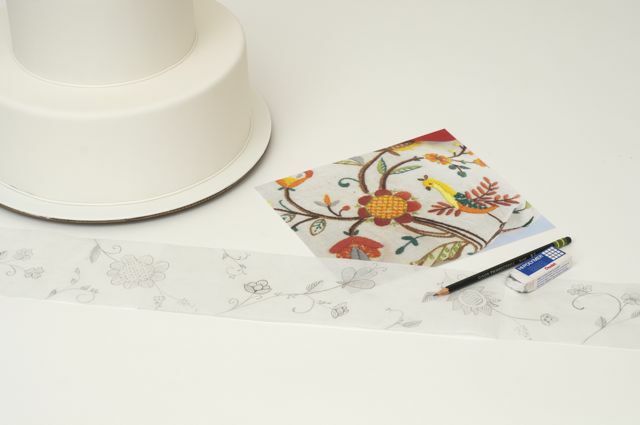 Satin Stitch - moisten area with water using your paintbrush, apply noodle strip in one direction and cut with xacto knife. 10. French Dot - roll small balls of paste; moisten the back with water, and using a toothpick apply to the cake. Add a little pressure with the toothpick to mark a hole in the center of each ball. 11. 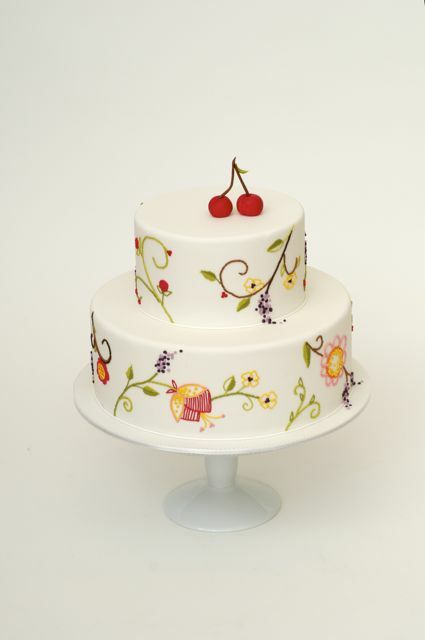 Finish cake with confectionary cherries (can be made out of marzipan, sugar paste or Satin Ice Fondant). This is terrific! Any advise from the Sweet Genius is welcome! Thanks! Thank you so much for sharing! Every time i saw that cake on Sweet Genius I was wondering what the techniques were to create it. Can’t wait to try this! this is amazing i have to try ! Thank you sooo much! Beautiful cake! ADORE ADORE ADORE this. just…swoooooon! Beautiful! Keep them coming. Anytime I can learn from the “Genius” I’m in! Dios mio, es precioso, que gran trabajo!! weeeee..i have always been a fan of Ron…love his works and truly he is a genius…thanks so much for this tutorial…cannot wait to try this! Thank you so much for sharing this. I am a just learning cake decorating as a hobby and I love this technique! Is that just a regular clay gun or something special for fondant? Can’t thank you enough for letting us get a small glimpse of Ron Ben Israel’s work.I love his work ,I think I’ve watched each of his youtube videos hundreds and hundreds of times …and yes ,he still amazes me every time.Thankyou ever so much for starting this blog! This cake brought back allot of memories, as I come from a family that did allot of embroidery. YOUR CAKE is elegant and gentle. It reminds me of a garden after a Spring rain. I am looking forward to the second season of SWEET GENIUS. How special…..thank you so much for taking the time to share this technique. I am a novice decorator but would love to try this on a Mother’s Day cake I intend to make soon….. Thank you for sharing this technique !!! it’s wonderful…. Es una maravilla y un precioso tutorial!Gracias! Ron you did it again, total art. Thank you for sharing it with us. Always from the sweet genius. wow i have to do this its amazing! Thanks for this amazing tutorial.Her in Holland we are a big fan of your work !!! This is wonderful. Thank you so much for your generosity in sharing. Lovely! How I wish I can replicate this! Thanks for sharing. This is absolutely beautiful, thank you so much for for sharing and teaching this art. This is sooo original, thanks for sharing! WOW!! This is absolutely STUNNING, look at all that fine detail – I am truely amazed. Thank you so much for sharing this beautiful work…… I am wondering how you make the little yellow flowers with the dark centre?……. If you wouldn’t mind sharing please.